Shalom In The Wilderness: I couldn't resist! 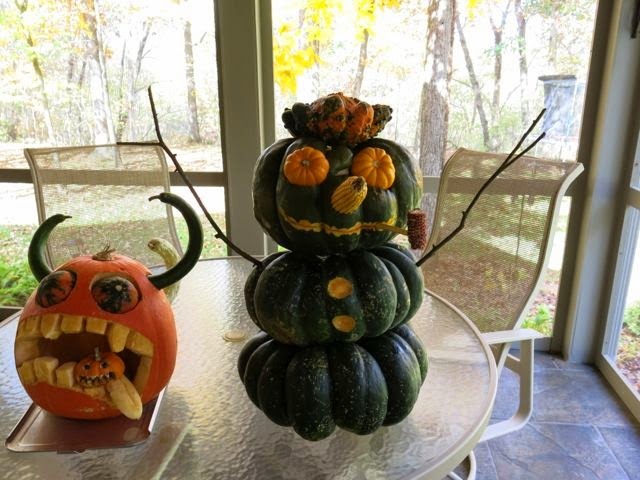 Included among the many pumpkins & gourds the granchildren brought from Nebraska were five green stacking pumpkins. Every time I walked past them I thought someone should try making a snowman out of them (even if he would be green) since they stacked so well. Finally I could resist no more. He fits right in with the pumpkin the boys & I carved on Sunday, don't you think? I've been concerned the earlier one wouldn't last until tomorrow to be entered into the contest, but I think he's going to make it. From "Like A Watered Garden"
Mychal Massie: Is Obama A Muslim or a Fool? So True & So Sad! Dr. Connie Williams - A Season of Awakening. . .